If a post goes up on Twitter or Facebook, and no one is around to engage with it, does it still make a sound? Not if you’re trying to build up a brand it doesn’t. Whether your social media efforts are for personal or professional gain, they still require a certain amount of — well, effort. And, unless you’ve got a lab in your basement that manufactures that elusive commodity known as free time, you probably don’t have either the appetite or the ability to expend effort without receiving some sort of return. And, the best way to guarantee that your time investment nets a nice big return is to first identify the topics that are most likely to get your target audience talking about and — more importantly — sharing what you write. To figure out which topics your target audience likes to talk about, you first need to identify who that target audience is. 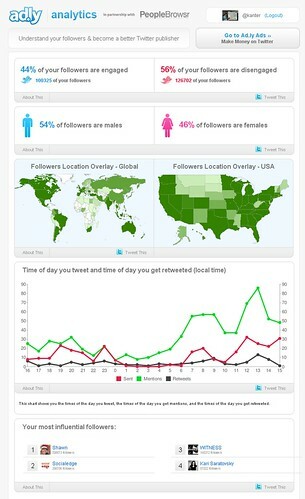 Ad.ly has a great analytics platform that breaks down the geographic and demographic makeup of your Twitter audience, but since the platform is still in Beta, you need to give them your email and cross your fingers for an invite. While you’re waiting, Klout will help you identify who your social media efforts influence the most, and tell you which topics you talk the most influentially about. You can also use Export.ly to break down data like location, time zone and bio for your Twitter followers, and activity, engagement and comments for your Facebook fans. Plus, there’s always Facebook Insights to help you get demographic data like age, gender, language and the like for folks who like your posts and pages. Once you’ve got a handle on who your followers are, the next piece of the puzzle is figuring out what they want to talk about. To do this, you could go the manual route — going back through some of the aforementioned tools, like Klout and Facebook Insights, to see which topics you’re considered most influential about and which posts get the most likes and shares. Similarly, you can also look at a site like Crowdbooster to see who your most influential followers are, and hone your topic choices based on their profiles. Crowdbooster also has a dashboard that shows you which of your Tweets got the most replies, which is a great indicator of which topics you should probably talk about more. Tweetstats also has a similar feature, allowing you to hone in on your Tweet density, as well as a nifty ‘Tweet cloud’ that shows you which topics you already talk about all the time. If you’ve got a few bucks to spare, ViralHeat will makes a great companion to that sort of info, as it generates all sorts of charts illustrating what goes viral from your accounts and when. The plus side to ViralHeat is you can chart Facebook, Twitter, your blog and any other social media efforts you’re making all in one place, although it does take a monthly fee and a little bit of elbow grease to get it all set up. If you want to stick with the free tools, TweetEffect tells you which of your Tweets resulted in a gain or loss of followers, complete with a color coded timeline of your Twitter history. And, Facebook Insights will give you a similar sense of which days you generated a lot of likes and comments, and which days you didn’t, which you can then use to infer which posts got people talking and which were met with radio silence. For more guidance on that, check out this recent Mashable article detailing all the ways to make the most of the Insights platform — especially section 2, which goes into a lot of useful detail about content optimization. Now that you’ve identified who your audience is, and what they like talking about, there’s only one thing left to do. Stop reading this post and get on with writing a few of your own — after you’ve shared this article with all your fans and followers first, of course.